Given its location, the TAO’s is definitely not one of the cheaper places in Zurich. 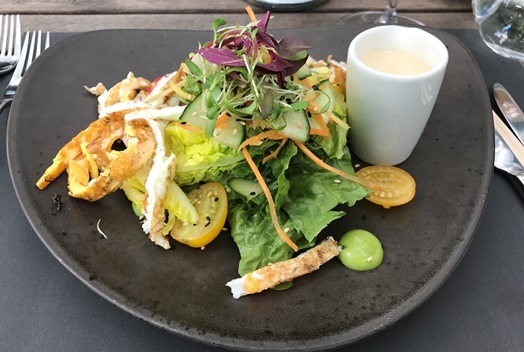 However, at least for lunch, you can mange to find something decent, so I went for the “TAO’s Caesar salad with romain lettuce, egg, avocado, and ginger sesame dressing” (CHF 22.00) which was a decent portion and a light and tasty starter. 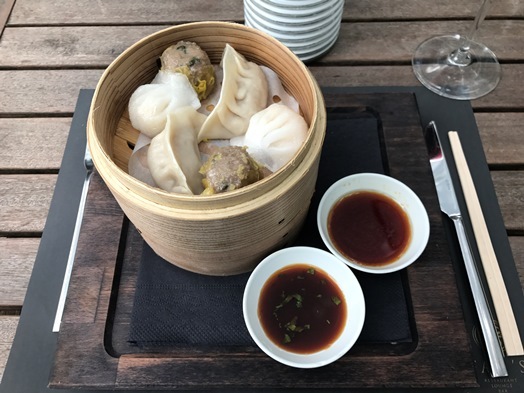 The “steamed handmade Dim Sum – mixed (filled with duck, beef, and shrimp)” (CHF 38.00) were definitely good. However, after just coming back from Taiwan where I had ‘original dumplings’, it was just somehow not the same anymore. Definitely still good, no doubt about that, but I guess I would have been more impressed if I didn’t just come back from Taiwan. What I liked a lot too was the “bread with curry dip”. I mean, the dip was rather simple but the bread was great in terms of taste and texture. The service is friendly and also rather swift which – I think – is a key element if you want to enjoy a lunch during the week – and you’re not on vacation. I like the atmosphere in the TAO’s a lot – you get to sit outside in the shadows enjoying the summer without sweating your suit through. Definitely a plus. Just make sure to book your table in advance as the place gets super crowded during lunch.